Dresses are not made to your measurements. You choose a size based on them. Bridesmaid dress designers provide their own size charts which reference bust, waist, and hip measurements. 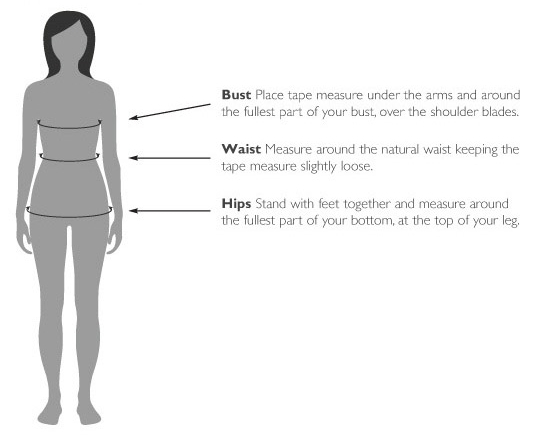 You need these measurements to choose your size. Alterations are almost always necessary to make the dress fit properly. If your measurements fall between sizes, consider the largest measurement as well as the style of dress when determining size. It is usually easier to take the dress in than to let it out. And while it's great to want to be positive about a healthy diet program, try not to overestimate the results of one. always use a fabric tape measure. keep tape measure parallel to the floor.